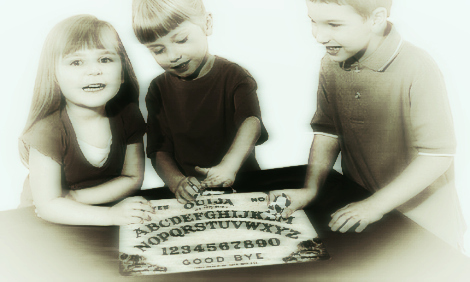 Daily 2 Cents: Kindergarten Teacher Used Ouija Board With Students -- Pennsylvania 'Werewolf' Reported -- Photobombed by a Ghost? MILWAUKEE — A kindergarten teacher at Zablocki Elementary School was removed from her class Tuesday because she used a Ouija board in front of students. "Just wanted to get your side of the story," WISN 12 News reporter Christina Palladino said to the teacher. "Yeah, I know, I'm sorry. It's, I guess, not what it seems," the teacher said. The teacher was put on leave after a parent reached out to school leaders. She was upset by what her 5-year-old son was exposed at school Friday. The child told his mother his teacher turned off the lights, pulled out a Ouija board and started talking about scary stories and spirits. She did not want her identify revealed Tuesday night, but said she is satisfied with the school's response. "I'm happy that she's being investigated. Maybe she'll think twice about doing something in the future," the mother said. Aware of the backlash she's receiving online for speaking up, she said she's only protecting her son. "I feel like what I did for my child was the right thing, but everyone is entitled to their opinion." In an email response to the mother, the teacher said the Ouija board had been in her classroom since October and that the kids had been asking about it and to tell scary stories. She said she never talked about spirits. According to a FOX News report, group of militarized police in Carabineros, Chile were spooked after experiencing what they reported to be a sequence of paranormal occurrences in a home they entered after a terrified household made the call. "Upon arriving, we could observe that there were several broken windows and mattresses outside the house," Police Sergeant Boris Olavarria told the local press concerning his visit to the home in the southern city of Puerto Montt. "The family told us that there had been paranormal activity." "At first, it was strange, but once inside, I was questioning one of the owners when a trowel fell down from the attic." Olavarria also said he believes he was attacked personally while in the house. "I called upon the devil, telling him to get out of there and when I was leaving I felt a knife that grazed my back. Since I was wearing a bulletproof vest, I was able to avoid injury," he said. The resident dwelling within the home told police that something was "lifting objects" and lighting "small fires." "There was a moment when one could detect smoke and there was nobody inside," a Carabinero guard also present at the scene said. The family reported seeing an unknown feminine silhouette that they say screams, telling them to leave the residence. It appears on their videos and phones at night, reports say. ADEL, GA (WALB) - Selfies have become a natural part of people's lives, especially for teenage girls, but the image one Adel 13-year-old caught on her phone gave her the chills. According to a Facebook post by Jessica Ogletree, there are only two people in the picture her daughter Haley took, but looking at the photo, there appears to be three. Haley and her brother Kolton went fishing with their grandparents on Saturday for Kolton's 12th birthday. After Kolton caught the biggest fish he had ever reeled in, Haley took a selfie and didn't even know what she had captured in the photo. After the kids got home, Haley started going through the photos she had taken that day. Her picture had a person in it Haley had never seen before. In the photo, you can see Haley sitting in a truck, with Kolton in the bed and a man standing right in front of Kolton. According to Jessica, the two kids and their grandparents hadn't seen anybody out at the back ponds in Paradise where they were fishing. Jessica also said that Kolton explained that when Haley took the photo, he was fixing the tacklebox and nobody else was there, despite the fact it looks like there is a man right in front of him. When Haley, who wants to be a photographer, realized what she caught on camera, Jessica said she freaked out. Jessica shared the picture on Facebook and it has already been shared more than 2,000 times and it has received more than 1,000 reactions. Comments on the original post range from skepticism to shear belief in it being a ghost photobombing Haley's selfie. Despite being scared by what she found, Haley has enjoyed seeing what people are saying on Facebook, even though she's worried people won't believe her. Werewolf - November 16, 2016 - East of West Newton, PA - witnesses observed a man transform into a wolf-like creature. WTF Is Going On With These Creepy Turkeys Circling A Dead Cat?